It's no secret that as editors, we spend our days seeking out the best style advice and pulling inspiration to help you wear the newest trends and get the most out of your closet. But one thing we don't do enough of is compiling outfit ideas. This month, that all changes. Here we present to you a slew of outfit ideas that are just waiting to be copied and pasted into your wardrobe. With a cool look for every kind of day, consider the rest of your March outfits sorted. Though it's spring, we're still wearing this winter staple: the basic turtleneck. Underneath button-up shirts and boxy jackets, the classic knit makes your look feel a touch more forward. Colored tights! 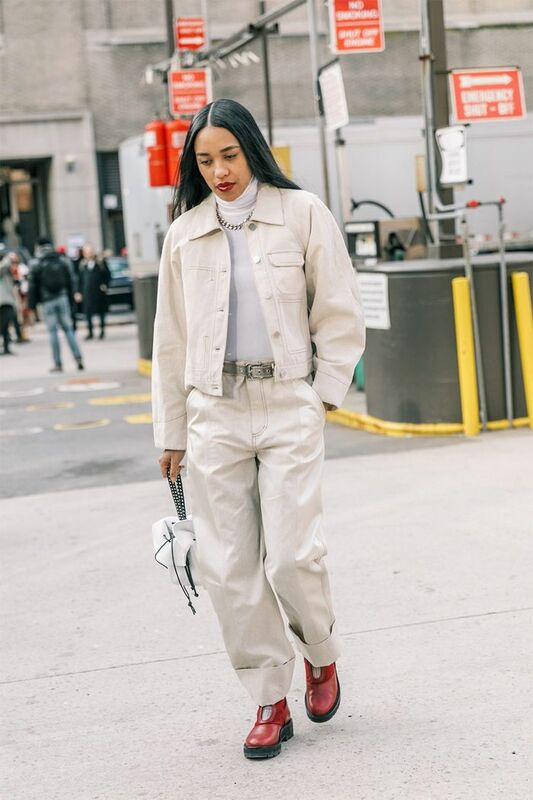 The trend that blew up at this past New York Fashion Week is made for this time of year where we're all itching to lean into spring's bright looks but still need to protect ourselves from the cold. If we didn't already prove to you the power of graphic color-blocking, this look should settle the case once and for all. Two is better than one. In this case, both of these cool looks are inspiring us to throw a wide belt over just about anything we're wearing. Boxy, oversize jackets are my favorite outerwear style right now. Wear one to add a creative shape to your look, and balance out the volume with another spring favorite: a micro bag. I'm such a fan of tonal dressing right now (okay, always). I find it to be the styling trick that makes any outfit suddenly appear much more elevated. Itching to break out your miniskirts? Pair them with oversize knits and matching ankle boots if it's still freezing where you live. We were wary, too, when we heard cargo pants were now a thing. But take the utility-inspired pant and give it a whimsical take with rainbow and a fun see-through bag. Another A+ case for the cargo pant. A statement coat can do wonders for you. This outfit is all the proof you need. Yet again, the tonal dressing look has won our hearts. This time, though, varying shades of vibrant green are freshened up by white boots. Let this tomboy vibe inspire your next pant look. And a small chain belt will take you a long way in achieving a certain level of cool. We just got a whole new perspective on spring's major color trend after we saw this incredible look. Our main takeaway: accessories are everything. Now, this is an outfit we can't wait to copy and paste into our lives: leather jacket, graphic tee, printed pants, and neutral sneakers. Try pairing leopard print as an accent against red tones for a fresh-feeling combination. Though the jacket has always been a classic, we love how fashion people are remixing the trench coat to feel totally on-trend, like wearing it with graphic polka dots. When in doubt, try this winning outfit combo: blazer, midi skirt, and ankle boots. An asymmetrical skirt is begging to be layered with tights and a cool jacket. If you try any shoe trend this spring, let it be Western boots. In modern new designs, you'll find yourself wearing the substantial boot with just about everything. Forget what you know about an all-white look being intimidating. Play with proportions like a cropped top and relaxed trousers to add dimension to the look.